Green Tea Extract (Green Tea Extract/Polyphenols/Catechins/Caffeine) is produced from green tea leaves and is used for its health properties due to its rich antioxidant and polyphenol content which can benefit the heart and blood vessels. It has recently become popular as a weight loss supplement. Green Tea Extract (Green Tea Extract/Polyphenols/Catechins/Caffeine) is produced from green tea leaves and is used for its health properties due to its rich antioxidant and polyphenol content which can benefit the heart and blood vessels. It has recently become popular as a weight loss supplement. Many people have used it for digestive problems, osteoporosis, headaches, diabetes, kidney stones, as well as other conditions. There are certain molecules found in green tea known as polyphenols. EGCG (epigallocatechin gallate) is a particularly active polyphenol compound with potent antioxidant properties. Studies have shown potential benefits in the treatment of cancer, due to it inhibiting a type of anti-apoptotic protein and decreasing the growth of abnormal cells. It has also shown promising effects in the protection of cartilage and prevention of joint deterioration, and has been researched for HIV, chronic fatigue syndrome, spinal muscular atrophy and other conditions. Polyphenols may also help prevent neurotoxin induced cell injury, which could benefit patients with Parkinson's disease. 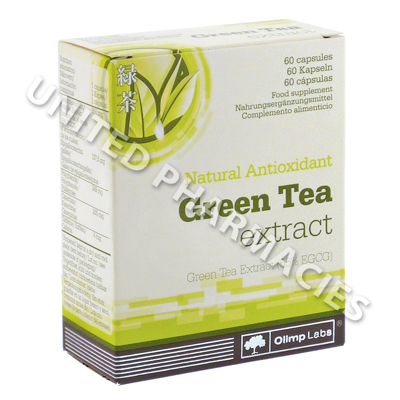 Green tea contains caffeine, a mild stimulant that can increase alertness and the ability to think. This is believed to occur due to it triggering the release of neurotransmitters in the brain. As a result of this, it can increase energy levels and relieve tiredness. 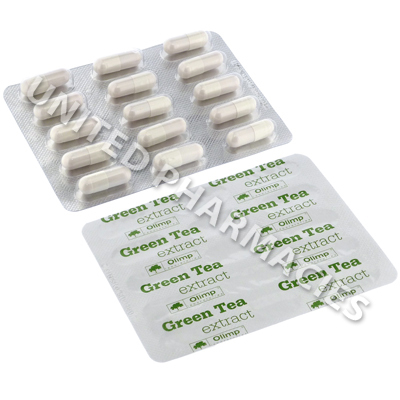 Green Tea Extract (Green Tea Extract/Polyphenols/Catechins/Caffeine) is provided in capsule form. A visit to the doctor is necessary to determine the proper dosage. In some cases, adults have been told to administer 1 capsule per day, after the consumption of a meal. It is important not to exceed this dosage, due to the risk of side effects. Report any reactions to your doctor. If any signs of serious side effects are noticed, seek medical attention immediately. In rare cases, green tea may cause liver problems. There is a possibility that patients with liver disease who take this supplement may experience a worsening of their condition. Discuss this with your doctor before taking this supplement. These capsules are not to be taken by women who are pregnant or breastfeeding. Always use Green Tea Extract (Green Tea Extract/Polyphenols/Catechins/Caffeine) as you have been prescribed by your doctor. Never self-medicate or change your dosage without first consulting your doctor. The correct dosage can vary depending on your health, medical history, and the severity of the condition being treated.